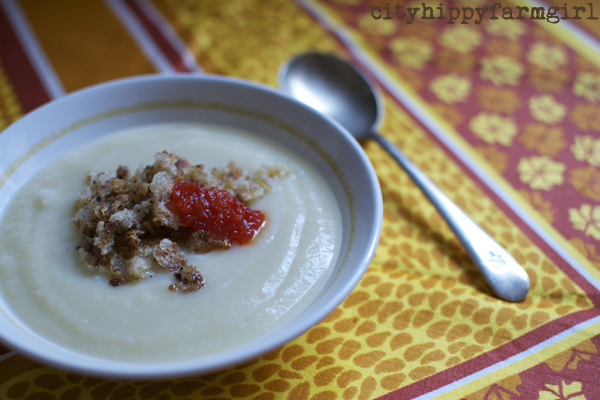 This entry was posted in Food Glorious Food, Making, Creating + Frugal Living and tagged cauliflower leek and potato, eating seasonally, foodconnect, locavore, Making, Creating + Frugal Living, slowfood, soup, sydney, vegetarian by cityhippyfarmgirl. Bookmark the permalink. 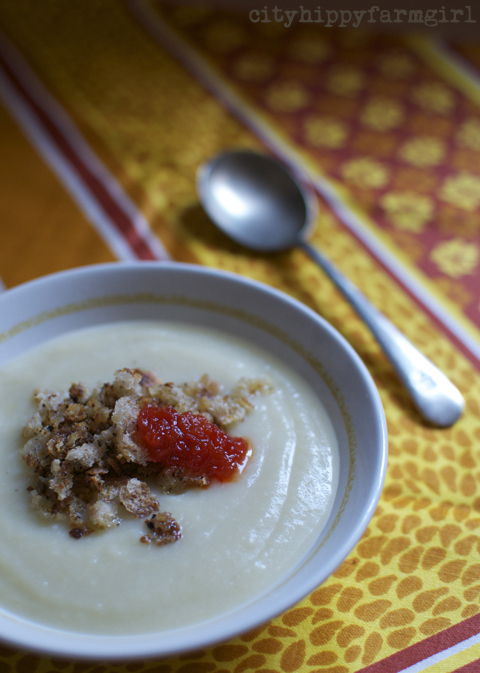 Cauliflower makes such a silky, smooth soup- so yummy indeed! I’d happily eat cauliflower every night of the week at the moment…until a new favourite/season comes along anyway. I love the addition of cauliflower to potato leek soup. I’ll have to try that this autumn! Lovely eating Brydie! I love thick soups like this! Eggplant and mushrooms were also up there for me Kari…all among my absolute favourites now, crazy huh. BTW – I have a first photo on my blog of my sourdough bread in my In My Kitchen post – will let you know when I post more about it – have my second loaf underway! I’ve been a cauli lover from way back. Have you ever seen The Darling Buds of May? (with a very young Catherine Zeta Jones). One of the twins (either Zinnia or Petunia) piped up when asked what vegetables she wanted with dinner “cauliflower cheese and baked beans.” It’s always stuck in my mind, because cauliflower cheese would have been my first pick too. Now I like it in curries, in Jamie Oliver’s cauliflower risotto and in soups. It’s just a great veg! So glad to hear you’re not ‘gagging’ at the humble old cauli any more – really is a good old fashioned veggie and I love it. I love anything with cauliflower! What a delicious soup you have made! Seasonal eating is the only way.